LabCollector Hosted is a lab information management software and electronic lab notebook (ELN) built around independent modules that interact with each other, managing a variety of day-to-day laboratory information. The software is used within small to larger labs, academics, pharma groups, and research and development (R&D). Using LabCollector, scientists can work efficiently by quickly accessing and modifying data which is made available to the entire lab community via the cloud. LabCollector’s management modules enable users to perform information and stock management on a modular basis. The storage system enables stocks localization that is managed using box cell grids and can be defined by point and click. LabCollector’s customization features perfectly adapt to any data scheme. Scientists can navigate lab storage places using a hierarchical browser tree, and all lab staff actions within the database are recorded onto history logs including audit trails and data versioning. A backup method is also provided for simple data storage on external and redundant media. All information that is stored in LabCollector LIMS is identified by a barcode. Scientists can create linear 1D and datamatrix 2D barcode labels for quick sample data retrieval and can be printed on stickers to identify tubes or documents. The solution provides a collaborative interface and is capable of extensive customization without any coding skills. LabCollector can be accessed from any computer as well as wirelessly from PDA devices. We started using this Software 3 years ago for all the Groups in our Department, we use it for cells in LN, reagents in freezers, slides, equipment (pipettes, instruments, etc...), plasmids, and General documents (SOPs).Very easy to adapt to your needs, you can have separate databases belonging to single Groups, very flexible System. Good support. Very easy to adapt to your needs, you can have separate databases belonging to single Groups, very flexible System. Good support. It can get very slow if you add too many records to 1 single module, we have 1 with 6000 records and it is a bit too slow. The Import of tubes through a box Reader should be improved (we have the scanner but do not use it), it is complicated to Import big data from another database. Thank you for your review. We love to hear how we can improve LabCollector for our clients. Since LabCollector v5.2 an improved indexing allows a much faster database support. LabCollector supports this way big databases with over 100 000 records for one module. Another point of interest considering LabCollector speed, it is the server capacity by having your LabCollector on your local server. We offer servers with high capacities such as Virtual private server as well as dedicated servers. Another improvement of version 5.2 is the import from Excel/CSV files! This has been improved making it simpler to import and new import tools are under progress. Batch Sample Tool is a free tool in LabCollector to import from any rack reader into LabCollector. We are compatible with any scanner brand using our direct connector ScanServer. Keep tuned as we keep making better versions every days! We wanted to implement an ELN in a start-up comany so we were looking for a program which is not too comprehensive but reasonably priced. Nevertheless, we were happy to find out that LabCollector is much more than just an ELN. It has repleaced not only hand-written lab books but also several spreadsheets at our company. The modular structure of the software is optimal for us as we can have the features which we really need and not pay for others which we would never use. It is also an advantage for a small company that you don't need to have your own server.LabCollector makes the organization of the lab much more transparent and efficient compared to spreadsheets and hand-written lab books. It is definitely worth the extra energy you have to put into it at the beginning to set up your system. In addition, good documentation also adds value to our products. Furthermore, Agilebio offers excellent customer support. LabCollector makes the organization of the lab much more transparent and efficient compared to spreadsheets and hand-written lab books. It is definitely worth the extra energy you have to put into it at the beginning to set up your system. In addition, good documentation also adds value to our products. Furthermore, Agilebio offers excellent customer support. There are some bugs in the program but if you report them to the developers they will try to fix them or at least they will suggest you a way to solve your problem. Very positive experience. This product has managed to fill a niche between desktop biobanking solutions and enterprise-class LIMS systems. It is a great LIMS that meets the needs of many academic research groups, institutes, and biotech companies. We spent years looking for a decent sample management software. Some of the key requirements that LC meet include: - web-based solution - software that could be implemented in house instead of being hosted by a third party. - no per user licensing fee LC goes beyond this set of requirements. There are a number of modules for managing other aspects of a lab operation beyond simply tracking samples. LC is progressively becoming a central hub of all our laboratory information. The use of a standard database (MySQL) makes it possible to access the data without going through the user interface when needed. Customer support is top notch. They are extremely responsive and helpful. We really feel that we get a personal attention. We spent years looking for a decent sample management software. Some of the key requirements that LC meet include: - web-based solution - software that could be implemented in house instead of being hosted by a third party. - no per user licensing fee LC goes beyond this set of requirements. There are a number of modules for managing other aspects of a lab operation beyond simply tracking samples. LC is progressively becoming a central hub of all our laboratory information. The use of a standard database (MySQL) makes it possible to access the data without going through the user interface when needed. Customer support is top notch. They are extremely responsive and helpful. We really feel that we get a personal attention. It is not always obvious to understand how the different modules complement each other. We had to develop our in house policies regarding the use of LC modules. The software is encrypted. We would prefer to have access to the source code so that we can better integrate this tool with our other informatics resources. Purchase 1 LabCollector LIMS license and get 1 year of web hosting (shared server) for LabCollector Hosted. Following years are 350 euros per year (academic price). Users can efficiently manage lab data and information with LabCollector’s various modules including samples, primers, plasmids, animals, antibodies and more. With LabCollector, scientists can manage, analyze and retrieve data while reducing room for error using the documents module which is ideal for sharing protocols, papers, projects and presentations. Users can efficiently label samples, primers, and products using the barcode feature that includes a series editor and custom barcode numbers. Lab staff can store chemical structures and create 2D and 3D models, linking them to reagents and search engines. Using LabCollector’s address book, scientists can manage various types of contacts including partners, clients and vendors as well as link client samples and data. Below are some frequently asked questions for LabCollector. Q. What type of pricing plans does LabCollector offer? Q. 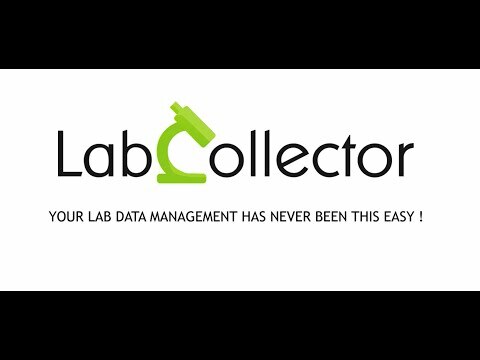 Who are the typical users of LabCollector? Q. What languages does LabCollector support? Q. Does LabCollector support mobile devices? Q. Does LabCollector offer an API? No, LabCollector does not have an API available. Q. What other apps does LabCollector integrate with? Q. What level of support does LabCollector offer? Q. Which apps is LabCollector compared to most often?